Philippe Robillard’s passion is visible throughout the entire operation of downtown Montreal’s only commercially certified organic farm. Leading the fight against Quebec’s enormous and rapidly developing agricultural problems, la ferme Pousse-Menu employs 20 dedicated employees working seven days a week and delivers throughout the entire province. La ferme Pousse-Menu is similar to Concordia’s Greenhouse’s 4 Seasons Sprouts but on an industrial level where healthy, hyper-sustainable product is being grown and packaged in downtown Montreal. Fresh sprouts, salads, dressings and crackers, to name a few of the farm’s products, are so delicious they have kept la ferme Pousse-Menu in business for 25 years. In recent times, there has been a wave of demand for organic, locally produced food. It tastes better, retains far more vitamins and minerals and helps stimulate the local economy. La ferme Pousse-Menu is an example of why urban farming is more delicious, healthier, stimulates local economy and is vastly better for the environment than big industry farming. For them, sustainability is a raison d’etre. Their operation begins with importation of organic seeds. 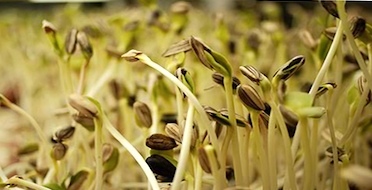 Most seed varieties are supplied by Mumm’s Sprouting Seeds in Saskatchewan. From there they are soaked with water for pre-germination and sprayed with a light dose of food-grade disinfectant. The seeds are then planted in trays of compost. The compost, a process which has been running for 25 years, is made from expired sprouts and organic fruit. The germinated seeds are then planted in trays and brought into the fog room. Full spectrum LED lights shine on each tray in the fog room allowing for a moist, warm environment which is ideal for sprout production. From there, the sprouts are harvested and cleaned. There is also a kitchen for cooking and making salad dressings and crackers. Unfortunately, the rest of Quebec is years behind the trend of urban farming. The government favours large-scale, industrial farming, the kind that harms the environment with chemicals and fossil fuel use. Family-run farms are an increasing rarity because of this trend and Quebec is quickly losing farmers. The average age of the Quebec farmer is 60 years old. A recent government report stated that our agricultural conditions are unsustainable, economically and environmentally. La ferme Pousse-menu invests a lot of attention on sustainable farming and is a role-model for Quebec’s future.